The Gavin Herbert Eye Institute at UC Irvine's School of Medicine offers an ophthalmology residency program that is fully accredited by the Accreditation Council of Graduate Medical Education (ACGME). We adhere to all common and ophthalmology-specific program requirements outlined by the ACGME. Resident trainees receive intensive and wide-ranging clinical and surgical experiences as well as opportunities to conduct meaningful research. An excellent formal didactic curriculum supplements the clinical and surgical training. Graduates are thoroughly prepared to enter a comprehensive ophthalmology practice or top subspecialty fellowships. Our residency program has a strong clinical and educational foundation across a broad spectrum of eye diseases and injuries. Resident trainees gain extensive in-depth clinical experiences at diverse teaching hospitals: UC Irvine Medical Center in Orange, the VA Long Beach Healthcare System and Kaiser Foundation Hospital-Bellflower. The patient populations at these hospitals make up a cross-section of age, demographic and socioeconomic groups. Distinguished UC Irvine faculty members representing the full range of ophthalmology services train a total of nine residents, including three new residents who are admitted each year. These specialists are committed to the goals of teaching, patient care and applied research. The smaller size of the residency program allows for extensive direct training and interaction with the entire faculty. The first year of training begins with a two-week introduction to the ophthalmology program, as well as to the School of Medicine's policies and procedures. First-year residents next begin clinical rotations at either the medical center in Orange or the VA hospital in Long Beach. For the first month, the resident gains experience in the practice of direct skills, including patient examination, refraction and ophthalmoscopy supervision. The senior resident and attending faculty members provide direct supervision and back-up. By the second month, first-year residents are performing minor surgical procedures such as lasers and office-based oculoplastic surgery. By the end of the first year, residents usually have performed one or two intra-ocular operations. 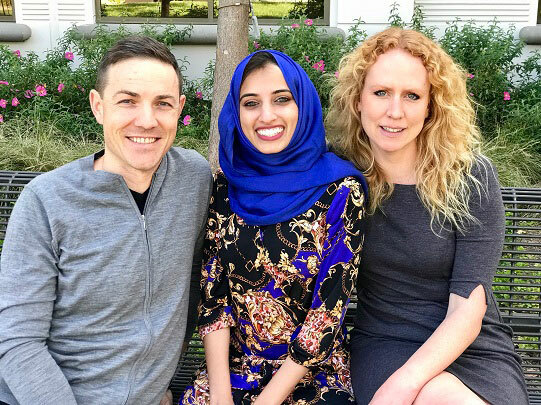 The annual rotation is a total of four months at UC Irvine Medical Center and eight months at the VA.
Second-year residents have increased autonomy and gain supervisory responsibilities for first-year residents and medical students. Second-year residents perform two to four surgeries a month and gain additional experience in laser procedures. The annual rotation is eight months at UC Irvine Medical Center and four months at the VA. In the third year, the emphasis is on surgical mastery. Residents perform four to 12 cases a week. They also are responsible for supervising the clinical activities of junior residents. A chief resident selected from among the third-year class takes on additional administrative duties, including schedule preparation, surgical assignments and serving as a representative of residents at faculty meetings. Third-year rotations are four months each at the medical center in Orange, the VA and at Kaiser Foundation Hospital-Bellflower. Research is an important aspect of the ophthalmology residency program. Residents are required to complete at least one research project that is worthy of publication in a peer-reviewed journal. Submission of the completed paper is expected before graduation. Each resident must submit a research proposal by the fall of the first year, outlining the aims, methods and budget for the project. First-year residents are expected to present this along with possible preliminary data at the annual resident's research day in May. For the remainder of the first year and into the second year of residency, more data are collected and analyzed. A paper or thesis is written under the supervision of a research mentor, with final results and conclusions presented at the May or June research day. Third-year residents are expected present a completed research project that has been submitted—or is suitable for submission—to a peer-reviewed journal. Department financial support is available to attend major scientific meetings when the resident is the first author on a paper or abstract. A request for financial assistance must be made in advance to the Residency Education Committee. All residents are required to attend the Basic Clinical Science Lecture Series presented by faculty members on Wednesday afternoons throughout the academic year. All subspecialty topics are covered in this 18-month series of lectures, which are followed by weekly lectures. Academic clinics usually are canceled to ensure residents can attend lectures. Weekend, early morning and evening lectures are avoided, when possible. Residents also are required to attend sponsored wet labs, lectures given by guest speakers, events sponsored by Continuing Medical Education and billing seminars, as well as financial and career workshops. Surgical training increases gradually during the residency program, with an emphasis on gaining clinical proficiency and competence by the end of the second year. A state-of-the-art wet lab with Zeis microscope is available. Residents must achieve competency in basic techniques in the wet lab prior to engaging in active human patient surgical care. Residents are a vital part of the Gavin Herbert Eye Institute, School of Medicine and UC Irvine Medical Center community. Residents attend monthly quality improvement meetings with the department chair and the program director to discuss system improvements. The chief resident is the representative and advocate for all residents, responsible for attending monthly department faculty meetings and serving as a member of the Residency Education Committee. All applicants entering ophthalmology training programs must have taken a post-graduate clinical year (PGY-1) in a program accredited by either the ACGME or the Royal College of Physicians and Surgeons of Canada. The PGY-1 year must include training in which the resident has primary responsibility for patient care in fields such as internal medicine, neurology, pediatrics, surgery, family medicine or emergency medicine. At minimum, six months of this year must include broad experience in direct patient care. Provide a current evaluation status letter from the Medical Board of California certifying qualification to pursue post-graduate medical training in the state. Applicants to UC Irvine’s ophthalmology residency program must register through the San Francisco Match Residency and Fellowship Matching Service. The Central Application Service (CAS), which is an automatic part of the San Francisco Match registration, distributes applications to specified programs. Applications not received directly from CAS will not be considered. UC Irvine’s Residency Selection Office must receive applications by September 1. Dean's letter (applies to graduates). To apply, contact San Francisco Match. Residents receive medical, dental and vision insurance, including coverage for their dependents (spouse/children) at no cost. Long-term disability insurance is provided as is profession liability coverage for all activities that are approved components of the residency program.